Cresttek Group, with its global design offices, has from inception built abundant domain-based best practices and methods to support its customers in all phases of product design and the validation lifecycle. Design Tools: CAD Application Expertise CATIA V5 / V4, UG NX, Pro/ENGINEER, SolidWorks, I-Deas, Inventor, Solid Edge, AutoCAD. Feature based CAD modelling techniques have enabled mechanical design to be automated for quick model update and regeneration. Engineering rules are written in the model for controlling the design intent and to standardize the CAD model to follow the formula’s limits. Simple parametric checks are written in the model for providing feedback to the designer on the dimensional limits. At part of our automotive service portfolio, we support IMDS data sheet creation for enabling component compliance to End Of Life of Vehicle ELV-norms. 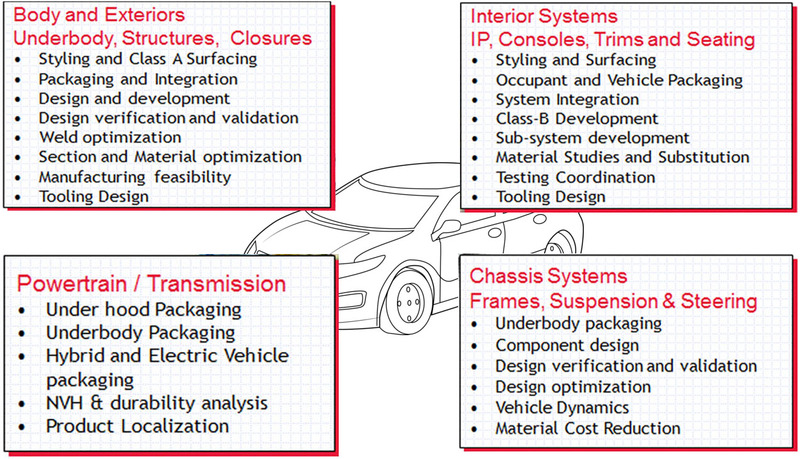 Our IMDS team is composed of automotive domain leaders and engineers to create, validate and store MDS data. We have trained our team to be experts in understanding the ELV directive for creation of MDS data and eliminate levels of checks.